In the spirit of The Guernsey Literary and Potato Peel Pie Society and The Unlikely Pilgrimage of Harold Fry, Gabrielle Zevin’s enchanting novel is a love letter to the world of books—and booksellers—that changes our lives by giving us the stories that open our hearts and enlighten our minds. I’m listening to this on BBC radio 4’s Book at Bedtime slot and it’s brilliant. The next episode is tomorrow night. I’ll have to get the book and read it unabridged! I’m delighted! I hope you enjoyed the rest of the program (and the book when you get around to it)! This is a story that should only be read by holding a book in your hands… one with a cover and pages. It has joined the ranks of 4 books (now 5) that I have read… books that I will buy and give to my friends and insist they read. No one has ever complained. Thank you for writing, and I am, of course, delighted to hear that! Curious to know what the other four books are? Last night I finished reading The Storied Life of A.J. Fikry trying not to wake my husband with my crying and sniffling. I immediately got out of bed to text my book loving friends to go get it immediately! Honestly, this morning, I started reading it again- something I never do. Loved this book! My husband heard the review and of the Storied Life of A.J.F. on public radio and thought I would love novel. I read it within 24 hours, and I do love it. I also love your characters dearly. I am sad it is over, but thrilled by the free gift with purchase: the many recommendations within your beautiful novel. I even borrowed American Gods from the library, which you mentioned in your Acknowledgements. (I only read the acknowledgements when I can’t bear to admit a book is over). Thank you! Really enjoyed this novel. Sad but so sweet at the same time. Loved the characters. Now I need to go reread the stories mentioned in the book. I just finished reading this very special book and I still have tears in my eyes. What a wonderful homage to lovers of books, words, turning pages and stories. I’m sure every independent book store in the world thanks you for this book. I’m a bookseller since last October in Argentina. Even though all my life was acompanied with books either because I went to the library or I had to study them for my literature classes, everything is new to me. Everyday, I find myself loving and admiring books . That’s why I read this one which has actually touched my soul. I just finished it, and I’m going over it again, to write down all the quotes and passages that inspire me and make me love even more my new life as a bookseller. Thank you so much for encouraging all these fellings in me. Lovely to hear from you! I wish you many years of happiness as a bookseller. Wonderful read & couldn’t put it down until I just finished the last word. I do object to the feel of the hard copy COVER. It feels soft and almost sticky. I had to take it off to read. Thought you should know this for next time. I have the cover in Canada depicting a father & daughter staring at the night sky. But inside was a revelation & I just loved your writing. I just selected this book for my book club this month. I am beyond excited to start reading this! I read a sample through Amazon & was sucked right in. I’ve been an avid reader since I was a kid, so I’m pretty choosey with the books I read, and I like reading things from authors I already like. (after all, every book you read changes you a little on the inside (: ) I loved Elsewhere as a kid, so it was like a Christmas when I got a copy of A.J. Fikry. The book was filled with hope and love, melancholy and triumph, and it was perfect for a book-lover. Its one of those books that leave you thinking about it weeks, months after you’ve finished it. Zevin is up there with all my favorite authors (Kingsolver, Atwood, Steinbeck) and as an aspiring writer I can only hope my books one day can have a similar effect on people. I am sorrily, not an avid reader. So many books get started and die the death of under 50 pages read. Not so with A.J. Fikry. I consumed this book like a box of chocolate truffles, savoring every paragraph. Thank you for the experience. Thank you peppering the pages with so many treats. Do you have a list of the novels referred in the story? I think I’d like to give some of them a try. I had to give the copy I had back to the library. Funny how they are such sticklers for returning what one borrows. I suppose I could buy a copy. I think it would be a wonderful addition to my small collection. But . . . if you have compiled such a list, I would be appreciative. . This is a true book lover, word nerd, book store goer’s novel. I felt so much kinship to fellow book lovers in this novel. It was such a sweet and sad storyline, but so well done I thought. Once you understand why AJ is writing those excerpts about books between chapters it just breaks your heart. Loved it. What is the CS Lewis quote that Jacob Gardner has tattooed on his wrist? (p 257) I loved this book! Thank you. I loved this book, too! It was chosen for me by my four-year-old daughter as a birthday gift. Perfect. This was so lovely. I feel like I am in a state of grief from having finished it. I never wanted it to end. There was so much truth, and beauty. There was humor too, and lightheartedness, which is why I am surprised that I am so devastated. This one will be with me always. I never had a favourite book, I realised quite in the beginning of reading this book, as I read about how a persons favourite book tells so much about her. I wondered what that said about me. Even before I finished it, I knew that now I do: the storied life of A.J. Fikry. Thank you for giving me my favourite book! This is a lovely, thoughtful, many-layered gem of a book. I wish I had had the imagination to write it! But thank you. Apart from the pleasure and satisfaction of reading it, you’ve given me things to think about in my own writing. Question: how come the hints of Indian heritage in AJF? Just finished your book and really loved it. I am sad that it is over. Will definitely suggest it as our next book club selection. Thank you for writing it! Good luck for the future! Thank you, and you’re most welcome! I’m confused. I am finding a title, “The Collected Works of A.J. Fikry” as well as “The Storied Life of A.J. Fikry”, both by Gabrielle Zevin. Is the first the compilation of books discussed in the second title? I have just finished reading your lovely book this very minute and all I can say is “you broke my heart”. I could not put it down from the moment I started reading it and I am now going to go back to the parts I liked best. The ending broke my heart -how I bought it I cannot understand but this book will be by my side for next few months. I never wanted it to end. It never expected it to end as it did – there was happiness and there was sadness and it has left me with so much to think about. Thank you so much. Hi! I just wanted to tell you that I loved this book. I’m a high school teacher, and I just fought to get A.J. Fickry on our summer reading list. It is on the final round of votes, so it’s almost there! Elsewhere was on our optional curriculum, and I love it, so I had to read your latest. I loved A.J. Fikry even more. Thanks! I’m looking forward to whatever you write next! Elaine from Beijing China here. 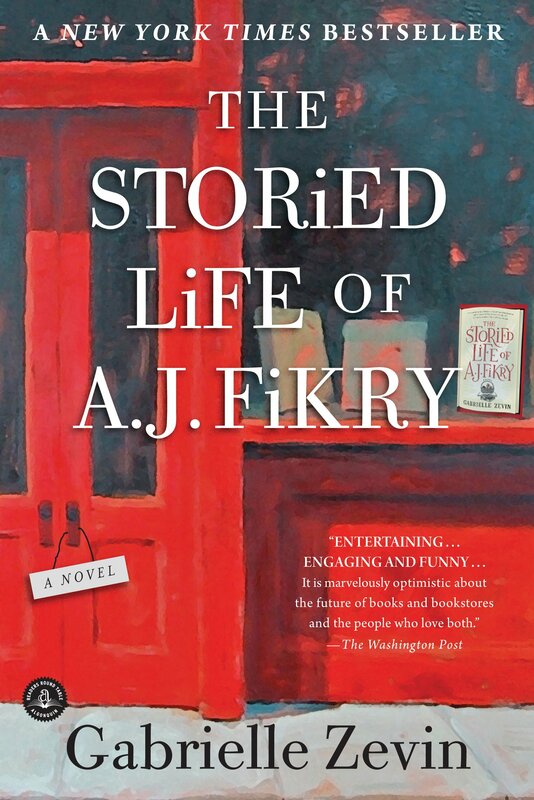 I just finished your The Storied Life of A.J.Fikry. I love your story. It doesn’t look like a novel to me, but a real life story. I believe in Jesus, and I believe he won’t let any one of us in the world as a lonely island. I am already a book reading fun, but you give me a solid reason to make my study room fully prepared for my baby. And I do believe in the word A.J. wanted to say to his little girl– love. Love everything about this. Love of books, community, love between adults and children, passion. Can find influence of great authors in this novel. Easy to read. So wonderful managed it in 2 days. Also I have a little Maya. Great choice of name! Thanks for snippets of other reads which readers will savour. We red more independent small book shops in communities! I’m hosting our LIbrary bookgroup (Bon Air Bookies) and when looking for cover artwork came accross the one for “The Collected Workd of A.J.Fikry” was the name changed? I really liked your book “The storied life…”, thank you for that wonderful journey! I cried at the end. Since I am a trained bookseller myself, I was even more happy about it.